Before I start the next ski test I am doing a review of the Reflex binding with R Style rear. I have been in the same bindings for 6 plus years so I was extremely worried about the transition. The Reflex system is used by a large percentage of the best skiers in the world so there is no question => if the system is good. The worry was how different it would be from what I have been using. I was especially worried about the R Style rear boot. It looks to be closer to a rear kicker than a full boot. I have been in double boots since about 1984. First set was yesterday. 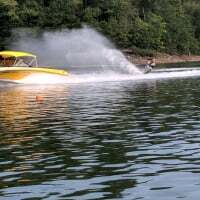 Being a chicken, I went off the dock at 30 MPH (32 off). That was fine. Not scary at all. So I tried 32 MPH. Not scary. So 34 MPH. Same result. Such a relief this transition is going to be easy. I ran a few more 32s and went back to the dock. Factory rear liner or something else?? buckled down tight? I wear my black cuff loosey goosey. Tight gives too much response on my Adam Cord special, I've yet to try it tight on the V-type. Cord has experimented with cutting slices in the reflex so he can tighten the buckles without so much response. Try the Shane Hill modification to the R-Style rear. It is much more comfortable and performs just as well. The Big Question is, how different does the R-Style Rear feel from a Full Size Rear Hard Shell ? I was always worried that it would feel LESS responsive. @Horton. Are you using the monoplate or the 2 separate plares? @Dirt. What is the Shane Hill modification? @Horton You were "extremely worried about the transition". Very understandable, I was when I first switched. So what ski did you pull from your expansive quiver to jump off the cliff with? @CaleBurdick Careful running the back cuff clip loose. Your foot might come part way out and tweak your ankle. Happened to me. I replaced the clip with a rubber band made from bicycle inner tube. Worked great. Now I've removed the cuff completely. It feels better with the rubber band just keeping the intuition liner from flapping - but I lost the band and I'm getting used to even more rear foot movement. Is a toe kicker next? @Horton what bindings were you on before the swap? I transitioned from double Strada bindings to the Reflex front and R-style in the rear. I had a similar concern in that I haven't skied with an RTP on my slalom for about 20 years. The biggest transition that I had to overcome was moving from "soft" bindings to a hard shell. Personally I didn't notice a huge change in going to the R-style. I'm using the thicker Intuition liners in both the front and back. I also went on Amazon and bought two small Velcro straps that I put around my rear liner. If I fasten them tightly it feels snug around my ankle and I don't really notice that I'm not in a traditional rear boot. More importantly it keeps the liner from dragging and filling up with water in the turn. What I like most about it is that there is no way my back foot will stay not come out in a crash where my front shell releases. In summary, the transition to the R-style from a rear boot wasn't as big a deal as I originally thought. I was trying to find a picture of the cut down rear binding. Shane cut the sides a little. Some people are removing the top buckle and lacing bungee instead. @eleeski I finally crashed and needed the reflex to release. Even though I wear all the buckles loose (just tight enough for them to stay closed), I released with no ankle tweak. Thank goodness. With a "DIN" of 5.5 So, my ankle feels good but face planting the ski kind of hurt! @Horton it's too sensitive if it's too tight. I agree with you that it probably impacts release / safety but of the single release I've needed it worked just fine. fingers crossed that it continues that way. I'm grew up using rubber bindings, then used Powershells worn loose as Dave Goode suggested, so loose is how I ski best. @CaleBurdick are you saying too much control is a bad thing? @CaleBurdick Glad the release worked properly. Interesting that @AdamCord cuts slices in his boot to make them more flexible. I wonder if the Reflex release properties change when the boot gets softer. Just leaving the clips loose shouldn't affect the Reflex release. Would a thicker and softer liner work as well? I really struggled with stiff shells. I switched to hardshells after trying and liking Fogman very flexible shells (I think the Fogmans were cut down to get softer). My current Radar boots have a soft enough feel with good support and energy transfer to the ski. @Ilivetoski , for me, being able to get to the right balance point on the ski is more important than transferring every movement to the ski. A softer boot lets me move to best balance myself. The softer boot also damps out my Touretts twitchyness. @eleeski the looser the buckles are the more your foot will deform before the energy is transferred to the release spring. I did life time damage to my right foot that way 8 years ago. Selling R Style. Used 1 time. Just not right for me.